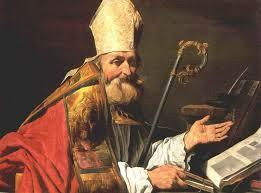 St. Ambrose was a small man with pale yellow hair like a nimbus. In the violence and confusion of his time, he stood out courageously resisting evil, strengthening the Church, and administering it with extraordinary ability. His learning gained for him the title of Doctor of the Church. When Ambrose had governed at Milan for two years, the bishop died, and the city was torn by strife over the election of a successor. When he stood up to protest a voice suddenly called out, "Ambrose, bishop! On December 7, 374, he was consecrated. The new bishop now gave his possessions to the poor and his lands to the Church, reserving only a small income for the use of his sister Marcellina. Conscious of his ignorance of theology, Ambrose began to study the Scriptures and the works of religious writers, particularly Origen and Basil. When Augustine of Hippo came to live at Milan, he called on the bishop, and in time the two became great friends. Augustine went often to hear Ambrose preach, and was at last baptized by him. One of Ambrose's topics was the blessing and virtue of virginity, when chosen for God's sake. At the request of Marcellina, he made a popular manual of his sermons on this subject. When Ambrose fell sick, he foretold his own death, saying he would live only until Easter. He busied himself writing a treatise called 'The Goodness of Death', and with an interpretation of the Forty-third Psalm. On Good Friday, 397, he partook of the Last Sacrament, and died soon after. He was then about fifty-seven and had been bishop for twenty-two years. His remains now rest under the high altar of his basilica, where they were placed in 835. Ambrose's varied writings influenced the development of the Church. He was the first of the Fathers to use Latin effectively, and as the Roman Empire declined in the West he helped to keep this great language alive by starting it on its new course in the service of Christianity. He enriched Church music, and seven of the hymns he wrote are still a part of the liturgy. His personality combined firmness where God's law was concerned with warmth, moderation, and generosity in all else. Trusted by sovereigns, loved by the people, Ambrose was-to quote Augustine's words after their first meeting—"a man affectionate and kind."